If you like Axis & Allies and want to try throwing a wrench (or in this case, hordes of brain-eating undead) into the typical mechanics of the game, then you'll likely find Axis & Allies & Zombies a fun new twist. If you're not already familiar with the Axis & Allies series, while fairly involved, this edition is not too hard to learn. The rules have been streamlined a bit and there is a set of quick-start rules (I love that more games are doing this). The game is currently marked down to $26 on Amazon, making this is a super-cheap way to get into the Axis & Allies series of WWII games. This gorgeous and satisfyingly weighty tome will tickle the D20s of any fan of Dungeons & Dragons, especially we older nerds who started with original D&D or AD&D. Over 448 pages, the authors (including game historians Jon Peterson and Michael Witwer) showcase the content, product, and artistic milestones of the 45 year history of this iconic roleplaying game and the vast fantasy universe that it has spawned. Some of the book and adventure module covers you will instantly recognize, others might revive long-dormant memories, and some undoubtedly will be never-before-seen (the TSR Hobbies belt-buckle and D&D Shrinky Dinks were news to me). While billed as a visual history, Art and Arcana includes plenty of textual history, covering the game, the business of the game, and its wider cultural impact. I honestly can't imagine anyone who loves (or loved) D&D not getting a huge thrill out of this book. See Cory's full review of the Special Edition of Art and Arcana. Besides the book, it comes in a lovely clam shell box and includes some litho prints and a facsimile of Gygax's infamous Tomb Of Horrors module. Richard Garfield, designer of such iconic games as Magic: The Gathering and Netrunner, set himself an interesting challenge for his latest creation, Keyforge. He wanted to create a card game where every single deck was unique, something now possible with today's digital printing technology. Keyforge is a card game where, unlike deck-builders MTG and Netrunner, you play the hand that chance deals you in the deck that you bought. Clearly, crazy algorithms work behind the scenes to make sure decks are reasonably balanced. The game's backstory involves a mashed-up world of creatures from across a universe and an artificial planet with hidden depths and buried secrets. To gain access to these vaults, players need to forge keys (the goal of the game) by collecting amber currency, achieved by skillfully playing your hand. The artwork is rich, wild, and varied, from monsters and cave-dwellers to grays, robots, and cyborgs. Besides this game itself being so fresh and fun, it also makes you wonder what other sorts of games are possible using this kind of on-demand printing. You need two of the unique decks to play. The rules can be downloaded from the Keyforge page on FFG. These first-reader-type books are the perfect gift for children of gamers who want to bring their nerdling hellspawn over to the darkside as early as possible. Done in classic ABCs/123s style, The ABCs of D&D and The 123s of D&D are written by RPG producer and publisher, Ian Van Norman, and lovingly illustrated by artist Caleb Cleveland. The books manage to evoke both the vibe of this type of pre-school reader and the imaginative excitement of a D&D adventure. Gateway drug! The much-anticipated 3rd edition of the beloved Arkham Horror board game finally slithered up from the dark depths at this year's GenCon. I've never played the board game, but I love Arkham Horror: The Card Game. 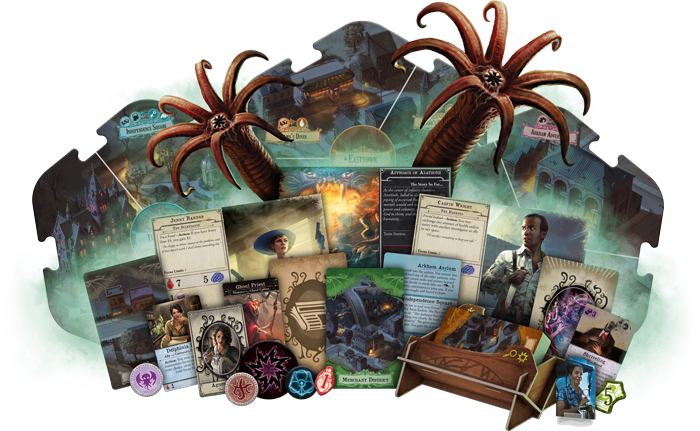 FFG seems to have never met a game component they didn't want to throw into the box, and true to form, the new Arkham Horror box is heavy with delicious cardboard crack. But it all serves the game well and isn't too overwhelming on the tabletop. The game combines and refines the best of previous Fantasy Flight board games in the Cthulhu mythos. It uses unique interlocking game tiles to build different map-boards of Arkham City based on which scenario you're playing. This game is very much story/narrative-driven and evokes much of the creepy and satisfying horror feel of the card game. You really do feel like you're working your way through solving a case of eldritch horror. The game is for 1-6 players, but rumor has it that you can easily blow past the listed 2-3 hours of playtime with higher numbers of players. Either way, you're looking at a full evening of immersion in Lovecraftian monsters and madness. Fans of the Betrayal series of games (Betrayal at the House on the Hill, Betrayal at Baldur's Gate) and the Legacy games (Pandemic Legacy, Risk Legacy) will likely want to check out the chocolate in my peanut butter mash-up of Betrayal Legacy. I've never played a legacy game, but I love Betrayal at Baldur's Gate. As in the previous Betrayal games, the house is very much a character in the game, but in Betrayal Legacy, the house and its malignancies persist, over generations, as you play through a campaign spanning from 1666 to 2004. In the first season of the Netflix horror drama, The Haunting of Hill House, the house basically wants to eat its inhabitants. Similarly, in this new twist on Betrayal, the legacy mechanic allows your decisions and your fate to linger in the house long after you're gone and your ancestors take... possession. Don't go in there! If you want a beginner or basic set of game paints, you can't go wrong with this set from Valejo. The price might seem high, but this is actually a great value, with sixteen 17ml bottles in the set. The set comes with primary and secondary colors and two metallics (silver and gold). The paints are very high quality with a high pigment count and a smooth mix of pigment and medium. If you learn how to properly thin and mix paint, and create washes, glazes, and inks, you can do a huge amount with this single set. Hands down, I would recommend this product over all other beginner paint sets for miniature painting. I cannot tell you what a change this light display made to my miniature painting game this year. I found out about it through one of Adam Savage's One Day Builds. For his build, Adam used Loc-line hosing to create a very bendable light. My light is mainly stationary, so I went with a cheap gooseneck-type arm I found on Amazon. The LED light panel allows you to change color temperature (3300k-5600k) quickly and there is a brightness adjustment (20%-100%). Earlier this year, I went on a search to try and find the best overall magazine covering all of my gaming obsessions, from board and card games, to RPGs, to fantasy, sci-fi, and historical miniatures wargames. I found it in UK's Tabletop Gaming Monthly. At US$150/yr, it's not a cheap subscription, but if you want to give a tabletop gaming fanatic a really special gift, this is just the type of purchase many people might not make for themselves.